Dandelions abound in the Spring. They are a first food for bees, and the pretty yellow blossoms create a gorgeous blanket of color among the newly green grass. Dandelions are spring magic to me. Their Latin name is Taraxacum officinale, and they are very beneficial for a variety of healthful functions. Dandelions are diuretic, laxative, nutritive, alkalinizer, cooling, and even aid as a digestive stimulant. The sunshiney yellow blossoms are so cheerful, so joyous, that I can hardly believe that they are considered by many to be weeds. As a first food for bees and butterflies, they also are a great medicinal item in your apothecary cabinet. You can make wine, coffee substitutes, teas, as well as many other great recipes that use the blossoms. I love to dry the blossoms and use them in lip balms, hand or body lotions, or even soaps! The best place to start utilizing these blossoms is with a dandelion infused oil. I prefer to pick mine in the late morning or early afternoon. The blossoms are the most open at this time. Simply pluck the blossoms off the stem and collect them in a bowl. When you get a bunch of dandelions, carefully shake them off to help remove any residents they may be hosting. Next, lay out on a dehydrator sheet. I use my Excalibur, but you can use whatever you have. Just be sure to choose the low setting. I dry mine for a full 24 hours to ensure they are completely dry. Any water left in them can lead to mold, so you want to be sure they are fully dehydrated. 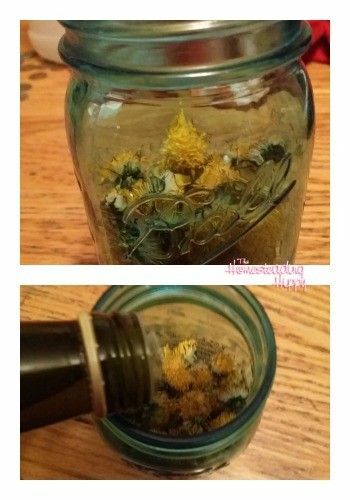 Place the dried blossoms in a jar and cover with oil. Some of my favorite oils to use for infusing are fractionated coconut, coconut, olive, or even apricot oil. There are two methods you can use to infuse your oil. One is to set the oil in a heat proof dish and infuse in a 250° oven for 2 hours. The other method is to set a covered jar in a sunny place and shake daily for 2-3 weeks. 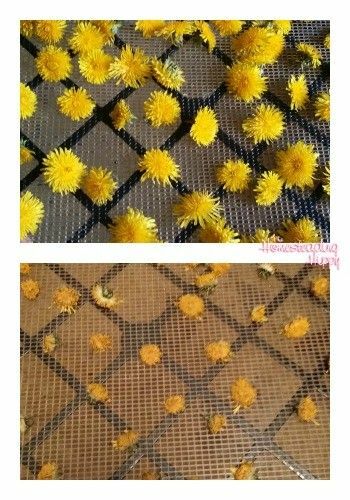 Whichever method you choose, you will get a delicious, sunny yellow oil when you are done and have filtered out the dried blossoms. The infused oil will last as long as the carrier oil you use. For that reason, I usually use coconut oil and try to keep my infused oil in smaller batches to use within 4-6 weeks. Check the expiration date on the oil you use. Add to lotions, soaps, or even lip balms. Need some ideas for using your dandelion infused oil? 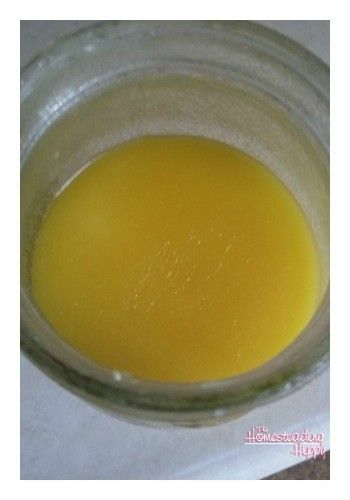 Try lip balm (get the DIY here) or soap! Have you ever made infused oil? Will you try it with dandelions this year? Be sure to pin this for later! Can I dry the dandelions and keep some there to use in the winter or anytime I need them? yes! as a matter of fact, I save blossoms for infusing in the winter when I run out as well! Just make sure they are very dry to avoid mold! if they are completely dry, they should last for at least 12-18 months. I so love you blog Heather. All the real stuff in one place. 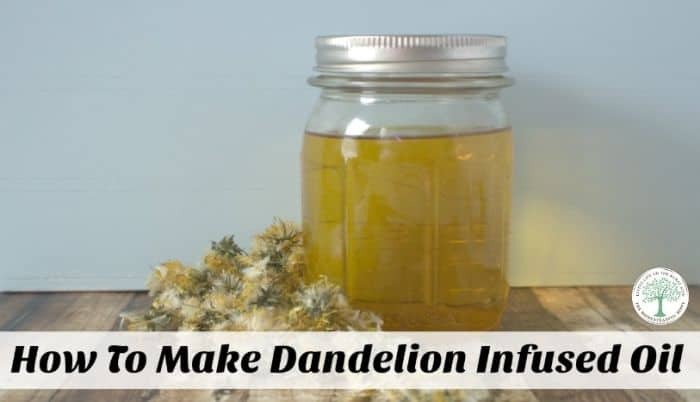 I’ve been hearing so much about the powerful properties of dandelions so I can’t wait to try this infusion. Awww, thanks! I am so glad you’re here! Let me know how you like it! Thanks Heather. Loved the post and I can’t wait to try this recipe! Will let you know how it all goes.